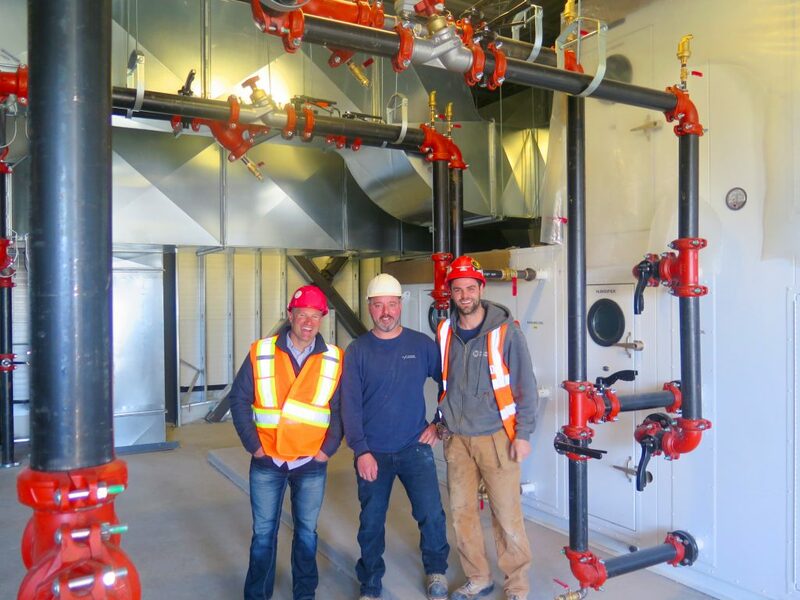 The Evolv1 project is just one of a number of ultra-efficient projects for Conestogo Mechanical, reported company president Wes Quickfall, at left, with sheet metal foreman Joe Golden and apprentice Brad Krouse. Energy positive may sound like the name of an alternative church in the Mojave Desert, but it’s actually the way most buildings may someday be built. The Evolv1 office building in Waterloo, Ont. is an early example. Some people put prophets, fortune tellers, soothsayers, and high tech brainiacs from the west coast all in the same category, but at this point, the Silicon Valley whiz kids seem to have been right about a few things and are winning life’s big monopoly game. In Ontario, some of Canada’s brightest IT prodigies have predicted that they can still have success in the Waterloo, Kitchener and Cambridge area, out of the ashes of the slowly expiring Blackberry conglomerate. In 2015 six developers christened what they call the “idea quarter” in this area, home to companies like Google, OpenText, Huawei and SAP. Sometimes called ‘Silicon Valley North,’ this region boasts 175 tech companies employing about 17,000 gifted prodigies. It has added 8,400 tech jobs in the past five years and was recently named Canada’s fastest growing tech talent market (second in North America), by CBRE-Coldwell Banker, the world’s largest commercial real estate and investment firm. 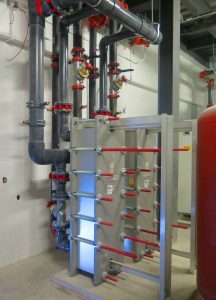 A heat exchanger protects both the system and the aquifer. As if to drive home Conrad’s point, Conestogo Mechanical president Wes Quickfall describes a long list of clean energy initiatives his company is installing, while walking through the Evolv1 site. The building’s heating and cooling system draws energy from an open loop water source geothermal system that taps into the Dundas Valley aquifer, located more than 350 feet below the surface and well below the Waterloo Moraine, an underground water source that supplies drinking water in the region. The aquifer water is pumped into a heat exchanger with heavy-duty welded plate construction and double-wall air space contamination protection. These measures protect both the conditioning system and the aquifer below. Condenser water from the heat exchanger supplies two Aermec NXP heat pump chillers, which in turn provide low-temperature hot water and chilled water to the 55-ton make-up air unit and five-ton atrium air handler. The Aermec NXPs are multipurpose indoor units operating on R410A refrigerant that provide simultaneous, independent calls for hot and chilled water year-round. Condenser water is also supplied to nine Mitsubishi geo source VRF heat pumps (three per floor). Each unit has 18 fan coil ports. Thermal heat is conveyed from condensing units out to fan coils with a series of solenoid valves moving refrigeration back and forth. In all, they deliver heating and cooling through about 120 variable speed modulating fan coils in about 110,000 square feet of space, in sizes ranging from 1.25 tons to four tons. “It’s among the largest VRF systems we’ve ever done,” noted Quickfall. There are also SolarWall sections on the south side of the building and mechanical penthouse walls feeding pre-warmed air into a Haakon make-up air unit. It uses a six-foot diameter energy recovery wheel to transfer heat to incoming fresh air. Inside the atrium, a three-storey plant wall improves indoor air quality. The entire mechanical system is controlled by a Carrier I-Vu building automation system. It is web-based, easy to learn and flexible. It allows users to monitor, test and tweak individual settings without a lot of programming and set up alerts. Due to the integration capabilities of BACnet and I-Vu, everything works together smoothly. The building saves water by collecting rainwater in a large cistern and supplying it to toilets for flushing. Plumbing fixtures are all low flow. Windows are triple pane and the LED lighting system dims automatically with the help of occupancy sensors. Instantaneous electric hot water heaters supply domestic hot water to bathroom groups on each floor, and the kitchen for the office part of the building. 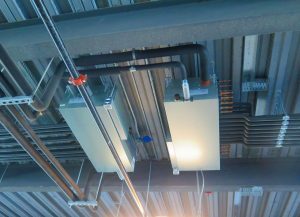 There are three VRF units per floor with up to 18 ports in each. The plan includes bicycle facilities and fourteen electric car-charging stations. A planned Waterloo light rail transit system will run right past the property. All the office building systems, including domestic hot water heaters and a backup boiler, are powered by electricity. More than an equivalent amount of electricity for these systems and for computers, phones, electric vehicles, and so on, will be generated by a solar photovoltaic system. It will consist of 754 heliene mono-crystalline 72-cell panels on the roof of the building and 1440 panels in the parking lot. This will provide a maximum instantaneous output of 620 kilowatts of AC power, or about 105 percent of the facility’s expected annual energy usage, reported Mike Kraus of Vigor Clean Tech, Petersburg, Ont. 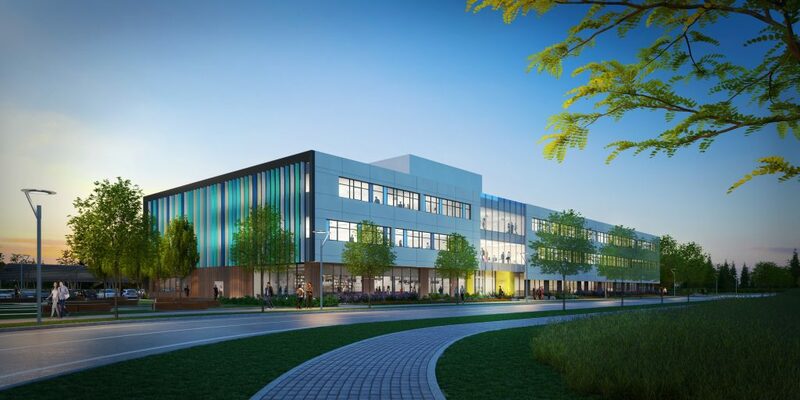 Cora was originally targeting leadership in energy and environmental design (LEED) platinum, but instead, the project was awarded the first ever LEED zero carbon designation by the Canadian Green Building Council. “We wanted to demonstrate that zero carbon, energy-positive buildings are possible without having to invest significantly more,” says Conrad. The project is expected to come in at less than $4 per square foot. Countries and regions around the world are moving building codes toward net-zero over the next 10 years. Net-zero occurs when a building produces as much energy as it consumes. British Columbia has established the year 2032 for net-zero residential buildings. It’s voluntary, but it’s in the building code, which suggests it might become mandatory. Ottawa is working with the Green Building Council and a year ago there was talk of net-zero targets. Despite political uncertainty in Ontario and Alberta, it’s likely that codes will move toward net-zero everywhere within a few building code cycles. In the U.S., according to the Net-Zero Energy Coalition, code changes and net-zero project completions are led by California, Oregon, Massachusetts, New York, and Connecticut. In 2017, there were 6059 net-zero buildings completed in the U.S., a 49 per cent increase over 2016. In California, new homes must have solar panels on the roof and must be net-zero energy beginning in 2020. New York City has adopted a program that requires city owned buildings to be 30 per cent more efficient by 2024, and all buildings to be 80 per cent more efficient by 2050. This will likely be accelerated. New Yorkers seem to have become highly motivated by Hurricane Sandy and other flooding events. Meanwhile, in California, the smarty-pants and soothsayers in their Ray-Ban shades are predicting a scorching bright future with “energy positive” becoming the next popular cult. Maybe we had better all pay attention, just in case they’re right again. An artist’s concept of the completed building.